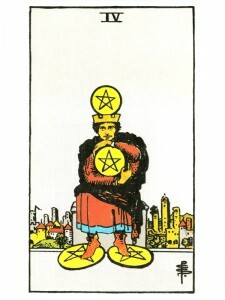 Four of Pentacles shares power and vitality – the ability to empower oneself and others. The gift of drawing to you the resources you need, combined with the ability to apply your full power in practical and tangible ways. You are fond of being in charge – you like power and will work very hard for money. You possess sound judgment in business matters and have well-rounded goals. You consolidate your power so that you act with assurance, but you must feel secure in your sense of worth – for only then do you have a sense of humor about yourself. In response to the troubles you have experienced, you have turned your focus to giving yourself a protective layer against any economic problems that might arise in the future – excluding others through your need for personal security and literally blocking yourself from the world around you. No matter how self-centered you try to make yourself – you will remain vulnerable to life. Accept that this selfishness is necessary now, for it is giving you time to re-structure and give meaning to the chaos and material universe you have experienced through meditation. Follow your enthusiasm, put your spirit into action – exercise and express your talents and dreams. The first step is always the hardest – seek within you the courage and strength to take it! Physical foundation and stability – reaping rewards for having become well centered physically/materially. This can be the completion of a significant physical phase, with the security of your accomplishments to back you up. Wheel of Fortune and Seven of Pentacles: Carry out your plans – success is all around you and you can benefit from this good cycle. Three court cards and Tower in the spread: Indicates a possibility of great loss – attend to your affairs and do not allow the influence of others at this time. Next to Moon or High Priestess: Investigate any proposition and do not sign anything until you are absolutely sure – there are undercurrents present in this situation. In the first position: The buck stops here, literally. You must deal with the pragmatic world, with responsibility for the provision of a solid physical and/or financial base. You are a strong link in the chain of civilization. You are an investor, a physical resource for others. The financial philosopher – the wise doctor. In the second position: Your greatest physical resources are just that, your physical resources. You are most fortunate to have the health and/or the wealth you need to support your projects. In the third position: Your physical/material foundation is secure and reliable. You are covered for your needs in the present and near future. In the fourth position: Physical security and its offshoots (health, wealth, status, safety, independence…) are the roots from which you are growing your relationships and your creative trees. In the fifth position: You are at work planning now on the affairs of your Physical Plane, on how to shore up, manage and improve your condition. In the sixth position: Here is the impact of success and abundance on your Emotional Plane. Prepare for the effect on your relationships. Backing will be available for your creative projects. Review this card’s general meanings, for this can be where your heart is headed. In the seventh position: Your mind will be focused on your physical/material foundation in the near future. This could be the time for investment, rethinking, taking stock. In the eighth position: It should come as no surprise to you that you are doing pretty well. Let this card here serve as a major focal point to reference, while interpreting all of the other positions. In the ninth position: Most important to your heart at the moment is your stability in the Physical/Material Plane. The feeling is positive, not a worry. Accept openly that your situation, be it health or wealth, is at the top of your want list. In the tenth position: Rest assured that your physical foundation will be healthy and secure by this time next year. How you achieve this may have some variations, but you are intended to know your situation will be solid. This spiritual insurance is intended to offer you peace of mind to contend with other matters in very much the same sense as a physical insurance policy does. Thank you for this beautiful interpretation. The whole of my reading was very positive and this was my outcome card which left me puzzled since many other interpretations on the web fare on the negative side. Yet this one truly resonates with my reading as a positive outcome that reinforces the messages in the rest of the reading. Thank you ?Blessings? I must also say that I find your interpretation very healing! After my readings, I always visit this site for further thoughts on the cards I drew. This new website design looks great! Thank you also for posting now possible interpretations of cards combination, this is very inspiring! hi your tarot interpretation is quite beautiful and healing. I’m curious if you’re interested in correspondence and discussion about symbology and the creative potential of tarot?